If there is one thing that Bamm Bamm does great it's smash! This caveman has been swinging a club around since he was a newborn. Now that he's all grown up, he still is the strongest guy in all of Bedrock. However, though his chest is as tough as a rock, his heart is as soft as mammoth fur for his sweetie Pebbles. 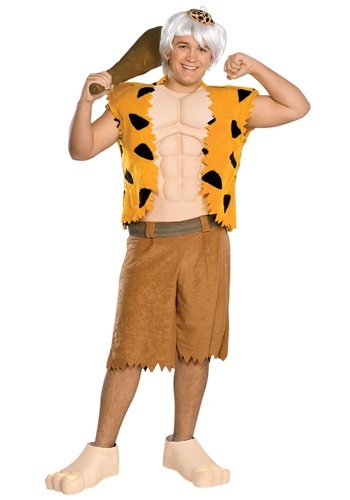 Now, you can become the buffest guy in all of the stone age in this Bamm Bamm Teen Costume! Bring everyone in the party scene to the city of Bedrock this Halloween when you enter the scene with this Flintstones-themed costume. They may not quite recognize you but that’s because you’ll be a grown-up version of Bamm Bamm. You’ve outgrown the loincloth diaper with the single shoulder strap. Now, you run all around Bedrock in a laidback pair of brown shorts along with an orange and black-spotted vest, open to show off your newly sculpted muscles. Don’t worry about having to hit the gym before you toss on this costume, we’ve got you covered. This costume comes with a foam chest piece that attaches to the frayed vest, so you’ll look ready to wrestle a dinosaur or saber tooth tiger to the ground. This costume also comes with a few included accessories like a white wig with an attached hat that matches the vest, as well as a pair of bare feet shoe covers to complete this caveman transformation. Grab an oversized bone or a club to carry around and you’ll be ready to properly portray this timeless cartoon character!